Today the International Spy Museum (SPY) launches its second mission on the GPS-guided Spy in the City® interactive visitor experiences: Operation Sly Fox. “This new mission … was developed with real intelligence officers and gives players an authentic understanding of challenges that real spies face,” said Amanda Ohlke, Adult Education director at the SPY. 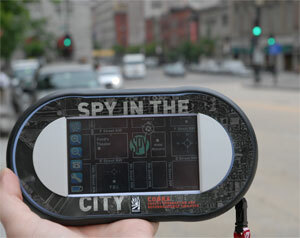 Operation Sly Fox is part of the SPY’s cutting edge GPS-guided outdoor mission, Spy in the City. To complete their mission, “operatives” must intercept an agent attempting to sell classified information to foreign operatives. Players will explore the nation’s capital with a GPS Ranger® device in hand. At predetermined locations throughout the city the Global Positioning System will download clues and information. Participants will analyze messages from sources and moles, along with documents, codes, and audio intercepts to earn points as they work their way to mission completion. This highly suspenseful adventure style mission offers participants the opportunity to test their spy skills as they explore DC’s neighborhoods. Operation Sly Fox is supported by a partnership with Groundspeak, a global geocaching organization. Bringing digital technology to classic spy craft, the geocaching community uses GPS technology and coordinate information to hide, uncover and transport items around the world. Embracing another opportunity for visitors to use new technology, SPY will have its own “Travel Bug”- a metal tag with serial number that can be attached to any item in order for it to be hidden and discovered. SPY tags will be hidden throughout Washington D.C.’s Penn Quarter neighborhood at sites with ties to the Spy in the City® missions. “The flexibility of this new technology allows us to provide museum goers with a more hands-on experience while keeping our information and spy craft current with the rapidly developing world of intelligence,” said Anna Slafer, SPY’s Director of Exhibitions and Programs.